How long until I can speak Korean? There is soooo much vocabulary! Do you have any tips on how I can remember it all? How do you suggest that I study your lessons? Do I really need to memorize all of that vocabulary? 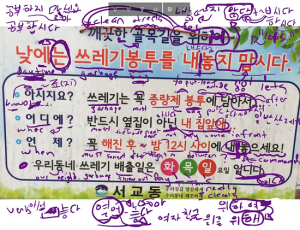 Why don’t you write the Romanization of words in your lessons? ㄱ doesn’t sound exactly like “K” all of the time! I want to study Korean to listen to K-Pop songs. What do you think? 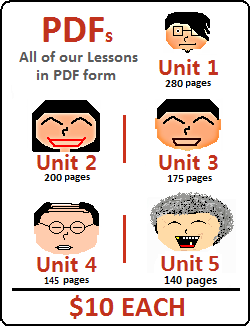 Have you ever thought about publishing your lessons in a book? How many lessons are there going to be? 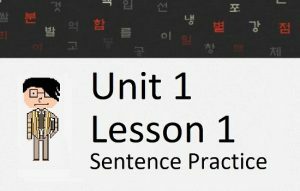 저 translates to “I” and “that” in Lesson 1! How can one word mean two things? You must have made a mistake. A long time. It takes a really long time. The answer to this question will greatly depend on how often you study. There is no easy way around learning any language, and especially one that is so functionally different than English. Let me give you an example of how much I studied when I was a beginner. From 2009 to 2010, I barely studied, and I essentially just taught myself how to read and say simple words and sentences. In 2010, I moved to Korea and was lucky to have a job where I had a lot of free time. I studied for 4-5 hours per day – with about half of my time dedicated to grammar study and half of it dedicated to vocabulary. In addition, I was living in Korea at the time which gave me the benefit of being able to practice what I was learning at every opportunity. As I got better and better (i.e. as I studied more and more), I was able to slowly start having conversations with people. I kept this up for three years. In 2013, grammar and vocabulary no longer became my main focus, and I focused more on practical reading, writing, listening and speaking skills. I had less time at this point, but I was still able to dedicate a few hours each day to my studies. This is just an example, but you need to accept that you will not learn Korean overnight. That being said, I did not have any good resource to learn Korean when I did it on my own. I have heard of people going from Lesson 1 to Lesson 100 on my website in about 8-9 months, which I would consider lightning fast (it probably took me two years to get to the point of Lesson 100 in my lessons). In either case, you need to be able to dedicate a serious amount of time to studying if you want to get anywhere. Trust me, it is necessary. These days, there are a variety of programs that can help you memorize words. One popular website is “Memrise,” which tests you with vocabulary you have already learned. You can find a link to Memrise on each lesson of our website that will take you to a Memrise course specific for those words. When I taught myself Korean, I didn’t use any fancy programs, however. My method for plowing through vocabulary was much more old-school. Every week I had a list of words printed on a piece of paper. That list would follow me everywhere I went for the week, and I would glance at it any time I had a spare minute. Waiting for the light to change green when crossing the street? Memorize a word. Waiting for your friend to pick you up? Memorize a word. Sitting at your desk at work? Memorize many words. Sitting on the subway? Memorize many words. Do this every day with a fresh new list of words every week, and you’ll pick up words in no time. 1) Spend about 15 minutes looking at the vocabulary, without actually memorizing anything. Confused about the usage of a word? Click on the English word next to it and the page will open up to explain how the word can be used. 2) Study the grammar portion of the lesson. The lesson will probably have a lot of words that you just looked over. While you actively study the grammar, you will be passively studying the vocabulary that you were just looking at. However, keep you focus on understanding the lesson at this point. 3) Go back and memorize the vocabulary. Now that you’ve had a glance at the list of words, and studied the lesson, you probably would have put some of these words into your memory by now anyways. Go back and memorize/study the remaining ones. 4) Read over the lesson one more time for a refresh. Balancing the grammar and vocabulary is difficult. What is most important is that you don’t focus too much on one or the other. My resource focuses on teaching grammar. As such, it is common for users of my site to zip through the lessons and understand what is presented – again, which is mostly grammar. I don’t “teach” or “explain” vocabulary – I merely present it. I use the words presented in my vocabulary lists in the example sentences of a lesson, but again, I don’t explain the words. You really need to memorize a lot of words. A lot of them. There is no way around it. The easiest way to not forget the words that you learned is simply practice, practice, practice. I highly suggest that you go through and memorize the vocabulary in a lesson before you move on to the next lesson. Otherwise, you will be getting ahead of yourself with grammar. I know that it takes a while. Assuming you are dedicated to your studies, it should take about a week to go through a lesson, understand the grammar and memorize the vocabulary. Romanizations (using English/Latin characters) to represent the sounds of Korean is inefficient. I say this multiple times in my lessons, especially in Unit 0. First of all, you are going to have to memorize all of the Korean sounds anyways, so you might as well just abandon them as soon as possible. Secondly, there are many ways English/Latin characters can be pronounced. How do you pronounce “u”? Is it pronounced like the “u” in “put” or in “tube?” Also, different accents pronounce letters in English in different ways. We can’t even ensure an accurate pronunciation of our own letters, and if we use these ambiguous letters to represent sounds in Korean, you are just asking for trouble. In addition, representing Korean letters with English/Latin letters leads people to think that the pronunciation is actually the same as it would be if written in English. Korean pronunciation is fundamentally different than English, and you will only make things more difficult if you try to represent Korean using a language that it is not related to. The best thing you can do is listen to the thousands of audio files we have across our website. Especially in earlier lessons, you will see that all of the Korean vocabulary and Korean example sentences have a link to an audio file of a Korean person pronouncing the word/sentence. Use these audio files to get accustomed to the sounds of Korean. 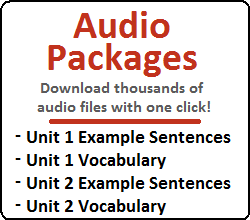 If you see any vocabulary word or example sentence that does not have an audio file attached – it will one day. My goal is to eventually have an audio attachment for every vocabulary word and every example sentence in Korean. Just give me time. I’m just one man. ㄱ doesn’t sound exactly like K all of the time! First, please read the answer to the previous question. Thinking that a letter in Korean will sound (and work) like a sound in English is nonsense. The phonetics of Korean and English are completely different and unrelated. As I said in my answer to the previous question – try not to force the pronunciation of English into Korean. It just doesn’t work. You can use letters like “K” and “B” to help you memorize the Korean sounds, but it is best to forget about English once you’ve past this first memorization step. Being able to understand K-Pop (or Korean dramas) is great motivation to learn Korean. There is no debating that, as this drives many people to start learning and continues to motivate them to learn. However, I strongly suggest not using K-Pop (and breaking down K-Pop songs) as your method of Korean study. Songs (in all languages) contain a lot of poetry, hidden meanings, and do not usually reflect a natural conversation. Instead of focusing on K-Pop songs, I highly suggest diving more into Korean grammar and vocabulary. Once you have a very good understanding of these, then it might be good (and fun) to start deciphering the meaning of K-Pop songs. One of the things that sets my resource above others is that it is constantly evolving. You can’t really do that with a book or some printed resource. The moment somebody messages me with a question that isn’t answered in any of my lessons (assuming it’s not related to a grammatical principle that I haven’t introduced yet); I find a place to incorporate it into my lessons somewhere. Although publishing all of this into a book sounds like a good idea – it doesn’t really reflect the goals that I have. I want my lessons and everything else to evolve and get better with time. I probably have enough content in my head and in my notes to get to around Lesson 250. That is what I am thinking right now, but by the time I get to Lesson 250 I might have learned more things that I can add to lessons beyond 250. On top of that, I have many ideas for lessons that will work as side-lessons (almost as a supplement) that can also enhance the learning experience. Don’t worry. I’ve got enough lessons to keep you learning for a while. There are many, many words that have multiple meanings – in English and Korean (and probably all other languages). Some learners are confused when they go through my lessons and see that there are multiple meanings for a word. If you are an English speaker and have never learned another language before, this might come as a shock to you. Most people don’t realize the amount of words in English that have multiple meanings. In that sentence, “left” is used three times and each time it has a different meaning. As an English speaker, was it hard for you to understand that sentence? The key to understanding a word (any word) is context. This is the same in Korean. In your studies, you will come across many words that have the same sound but a different meaning. .. Got a question that isn’t answered here? Feel free to Contact Us.